I revere science. Those who know me know there is much irony in that simple sentence. Here’s the sorry record: I struggled with high school chemistry, knowing throughout that I was in way over my head. I dropped out of high school physics, realizing early on that I was even further over my head and headed toward a failing grade. In an overall lackluster undergraduate academic career, by far my worst grade came in fulfilling the science requirement during my sophomore year in introductory geology, affectionately known as Rocks I — a science course deliberately tailored to the scientifically challenged. I never again came close to a science course. Yet, I revere science. So I was drawn to Timothy Ferris’ “The Science of Liberty: Democracy, Reason, and the Laws of Nature,” and Steven Shapin’s “The Scientific Life: A Moral History of a Late Modern Vocation.” Although both are about science, these are very different books: Ferris treats how the scientific spirit influences democratic governance; Shapin addresses how the scientist fits into our society. A professor emeritus at the University of California, Berkeley, Ferris contends that the rise of modern science and the scientific spirit are linked to democratic governance. 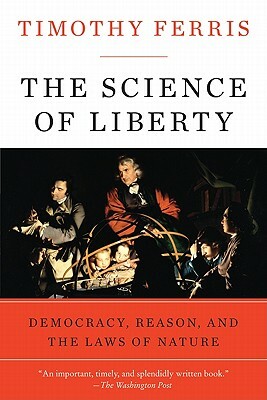 The democratic revolution, Ferris argues, was “sparked – caused is perhaps not too strong a word – by the scientific revolution.” Science “continues to foster political freedom today. . . [S]cientific skepticism is corrosive to authoritarianism and . . .scientific experimentation provides a better model for governance than any of the systems that preceded it” (p.2). Shapin, a professor at Harvard specializing in the history of science, describes the role and perception of the scientist in Western societies, particularly the United States, from the mid-19th century to the present day. During this time, a career in science transformed from a calling to a job. Scientists enjoyed an exalted role in the 19th century, when they were likened to philosophers whose calling was to discover the laws of nature. This role gradually yielded to one more in keeping with modern democratic sensibilities, where scientists began to work in large corporations and government, advancing corporate and governmental interests rather than simply pursuing scientific knowledge for its own sake. In the process, the scientist came to be perceived as being on the same moral plane as the engineer, insurance salesman and automobile mechanic. Shapin terms this the “moral ordinariness” of the scientist. It is important to note what Timothy Ferris’ book is not about. It is not an argument for utilizing the scientific method to resolve the problems democracies must confront. Nor is it an argument for government by technocrats. It does not emphasize technical expertise as the key to democratic governance. Rather, to be successful, democracies need the same open-minded, open-to-change spirit which characterizes scientific inquiry. Both science and democracy “start with tentative ideas, go through agonies of experimentation, and arrive at merely probabilistic conclusions that remain vulnerable to disproof” (p.13). Like scientific experiments, democracies tend to be “untidy, patched up affairs that seldom work out as expected.” Although repellent perhaps to the perfectionist, democracy has proven to be “tougher, more resilient, and better able to answer the needs of its citizens than any other.” And that is because democracy, like science, is “not built on hopes of human perfection but on an acknowledgement of human fallibility” (p.103). Indeed, claims of perfection are anti-scientific and anti-democratic. “The scientist who claims his theory is perfect is a crank; the politician who claims his administration is perfect is a tyrant” (p.14). Although written well before the outbreak of democratic sentiment in Tunisia, Egypt, and elsewhere during the “Arab spring,” Ferris’ view of science leads him emphatically to the conclusion that democracy is not inherently Western. Just as science is “practiced by persons of all races and religious beliefs, speaks a universal language, and evaluates results on the basis of merits rather than place of origin,” democracy is the province of “no particular culture but belongs to everyone willing to plant and cultivate it” (p.13). Democracy first appeared in states where science and technology were most advanced, Ferris argues, in England, America and the Netherlands (and “more fitfully” in France, Italy and Germany) because “science demanded liberty and demonstrated its social benefits, creating a symbiotic relationship in which freer nations were better able to carry on the scientific enterprise, which in turn rewarded them with knowledge, wealth and power” (p.7). The notion of democracy gained strength in the eighteenth century Enlightenment, when philosophers turned away from traditional beliefs and toward the values of inquiry, invention and improvement. Although other forces were at work, the Enlightenment without science would have been a ”steamship without steam” (p.57). Ferris addresses what might appear to be an obstacle standing in the way of showing how science is integrally linked to the 18th century Enlightenment and its democratic revolution: the huge influence that France had on the Enlightenment, and the undemocratic character of much of what passed under the banner of the French Revolution. Ferris sees the French Revolution as profoundly anti-scientific, the progenitor of modern totalitarianism at least as much as of modern democracy. French revolutionaries “neglected the fundamental lesson of science and liberalism – that the key to success is to experiment and abide by the results – assuming instead that the point of a revolution was to implement a particular philosophy” (p.113). The French philosophes were inclined to regard science as subordinate to philosophy, “bounded by the rules laid down by philosophers past,” thereby downplaying science’s “creativity and its political implications” (p.114). At the forefront of this anti-scientific philosophy was Jean-Jacques Rousseau, who all but dominated French thought from 1760 on and, more than anyone else, invented Romanticism – a “Manichean world view that champions sentiment over logic, caprice over common sense, instinct over civilization, and mysticism over clarity” (p. 115-116). Ferris’ indictment of Rousseau is scathing. Rousseau’s “fact-free thought” created a “new and pernicious style of philosophizing – one that consists of basing real world arguments on bald fictions, then retreating into a wounded obscurantism should anyone question the legitimacy of the enterprise” (p.125). The fascist ideal of an “all-powerful ruler who embodies the spirit of the people came straight from Rousseau,” Ferris argues (p.126). This is a controversial view which many experts reject, but one with which I agree. So how does the scientific sprit animate democratic governance in, to choose one example randomly, the 21st century United States? What can that spirit tell us about whether we should surtax billionaires, discontinue tax breaks for oil companies, turn Medicare into a voucher program, or cut the Defense Department budget? Ferris’ scientific spirit provides a means to answer these and broader questions about the proper role of government regulation in a democratic economy. Ferris quotes approvingly John Stuart Mill, whose mixed feelings about government intervention in economic matters plainly parallel his own. “There are some things with which government ought not to meddle, and other things with which they ought,” all the while conceding that the question of which is which “does not . . . admit of any universal solution.” (p.181). Ferris suggests that democratic societies must find the right balance between Hayek and Keynes, through a utilitarian trial-and-error process. Portions of Ferris’ argument seem libertarian in nature, compatible with the current Republican vision of a smaller state, with less government regulation and a relatively weak social safety system. He extols Adam Smith, whose Wealth of Nations was one of the very rare works which “actually, substantially, and almost immediately started improving the quality of human life and thought,” (174) to the point that its precepts now strike us as “largely self-evident.” (p.175). Smith advocated regulations and other legal restrictions on economic activity “only insofar as they are required to keep the market fair and free” (p.177). The beauty of the Smith’s free market, Ferris argues, is that it “benefits society as a whole without requiring its participants to act out of any loftier motive than self interest.” (p.177). Free markets, “provided that they are kept aboveboard, are more efficient, and grow economies faster, than do markets that are excessively regulated, controlled, or shielded from competition” (p.187). He emphasizes that in many developing nations, “needless government regulation has driven the majority of economic activity off the radar screens and tax rolls” (p.165). Although tempted by libertarianism, the scientific spirit leads Ferris away from a dogmatic adherence to unfettered markets as the key to democratic success. He cites polls that indicate that “those living in nations that distribute their income the most equitably report themselves happiest: The inhabitants of relatively socialistic nations like Iceland, Holland, Finland and Sweden show up happier than Americans, although Americans make more money” (p.155). Further, “over the past half century the American economy has performed better under Democratic than Republican administrations” (p.185). Ferris concludes, as Adam Smith and John Stuart Mill anticipated, that there is “no one right solution for all peoples when it comes to the proper economic role of government.” Liberal democracies may and should vacillate between Hayek and Keynes as they seek to reach the most effective degree of government involvement in the economy and extent of their social safety nets. There are good discussions here of why real science cannot thrive in totalitarian environments, Nazi or Soviet. (p.199-203). There is “no socialist science, no Western or Eastern science, no capitalist or communist or feminist or ethnic science. There’s just science and while one scientist may do it better or worse than the next, nobody can simply invent a different science and expect it to complete successfully with the real thing” (p.209). Ferris launches an effective assault on anti-science attitudes which one finds in some academic circles, “deconstructionism, multiculturalism, cultural studies,” which Ferris lumps together as “postmodernism.” These approaches “became so popular that generations of educators came to believe, and continue to teach their students today, that science is culturally conditioned and politically suspect – the oppressive tool of white Western males, in one formulation.” (p.237). This is strong stuff, but I found myself in agreement. However, I left this discussion thinking that Ferris was also going to hammer the anti-science attitudes that pervade wide swaths of today’s Republican party, those who believe that evolution is just another theory of the origins of life, to be considered on equal grounds with Biblical and semi-religious accounts; or that global warming and climate change are matters stirred up by Al Gore and a band of conspiring, self-aggrandizing environmental extremists. Although he discusses the climate change controversy, he barely touches on the widespread denial of evolution within much of today’s Republican base. I would have preferred a little more punching here. 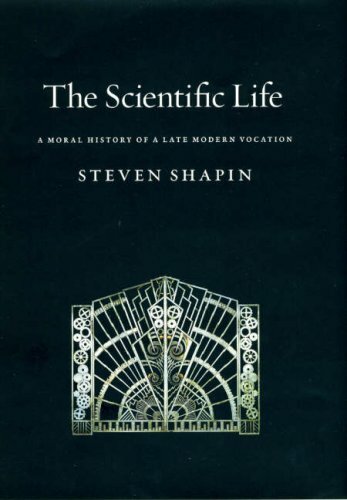 Stephen Shapin’s book starts in the mid-19th century, when the scientist was a lonely outsider, working individually on “pure” science, with little expectation of pecuniary reward for his labor (almost all scientists were male in the mid-19th century, a situation which has changed some but not all that much since that time). Charles Darwin, the century’s most famous scientist, embodied the notion of the “gentleman-amateur.” Darwin was “never employed to produce scientific knowledge, nor was the knowledge he produced designed to be of use to the contemporary structures of power and profit” (p.42). The scientist’s role was likened to that of a philosopher whose calling was to discover the Laws of Nature — a higher calling than simply applying those laws. This exalted role and perception of the scientist changed in the late 19th and early 20th centuries, as industrialization transformed western societies and scientists began to work first for major corporations like Bell Telephone, General Electric, and Eastman Kodak, and then government. In the corporate world, scientists usually worked in teams rather than individually, applying their expertise to advance the corporation’s interest in greater profits. Gradually, scientists lost their affinity to philosophers and became more like engineers and technicians, “morally no different from anyone else” (p.23). Knowing about nature was, Shapin writes, “no longer like knowing a divinely written book, but like knowing how a car engine worked” (p.25). This “moral ordinariness” of the scientist is a projection of modern “democratic sensibilities,” suited to “both the quantitative expansions of the scientific role and to changing institutional circumstances in which scientists increasingly found themselves – handmaids to the creation of wealth and enhancement of power” (p.127). propelled a generation of academic scientists into a world that was generally unfamiliar to them: the experience of large-scale organization; of teamwork; of interdisciplinary research; of unlimited resources and severely limited time; of close contact with the sorts of people – especially the military and the commercial worlds – they had not known much about; and, after the end of the war and the beginning of the Cold War, the experience – for some of them – of political power (p.64-65). Yet, as scientists began to fit ever more easily into corporate and government molds, an “emotionally charged” debate took place throughout the 1950s and into the 1960s over the role of the scientist, with many looking nostalgically at the lost role of the pure, 19th century gentleman-amateur scientist. According to one “classical trope,” the capacity to produce “genuine scientific knowledge” was only compatible with the “virtues of the free-acting individual” (p.173). Organized research was said to be a “prostitution of the very idea of science and a visible index of how modernity was going disastrously wrong” (p.96). The best expression of this mid-century angst was William White’s The Organization Man, published in 1956. Whyte saw the “individualism of the Protestant Ethic” being “systematically subverted” by the “deadening hand of corporate collectivism” (p.175). Whyte’s book came out in the midst of the Cold War, and was one of several works that contended that attempts to transform the making of scientific knowledge into a formally organized endeavor “could succeed only by sacrificing Truth, Progress and ultimately Power” (p.173). Were Galileo and Einstein alive in the mid-1950s, biochemist Erwin Chargaff wrote wistfully, they “might never get themselves funded by a Federal grant: too individualistic” (p.173). In the Cold War and McCarthyite context, the scientist was seen as being at the heart of a struggle between “authentic American individualism and the dark forces of conformity and collectivism” (p.120). The “defense of scientific individualism became a powerful way of reminding American society how much its security and welfare depended upon some of its least sociable and least conforming members” (p.177). In 1953, Fortune Magazine wrote that the scientist, “particularly the most gifted is, by almost any definition, a maverick. His endowments, drives, interests, political opinions, and even religious beliefs are not, in most cases, those of the majority of society” (p.182). While Big Science, as it was called, was “celebrated, condemned, and recurrently treated either as a major achievement or a major problem” (p.95), it continued to flourish unabated in major corporations, government, and academic research laboratories. In 1965, one commentator wrote that the scientist of the day was “typically an ‘organization man’” (p.197). A corporate science research section touted its virtues: “No geniuses here; just a bunch of average Americans working together” (p.177). A GE research manager wrote that, as a general rule, “no laboratory can afford to hire men who lack the generous spirit of cooperation” (p.184). By the mid-1970s, the debate was over: Big Science had won and America had come to terms with the scientific profession as a “route to a comfortably bourgeois style of living” (p.209). In the last section, Shapin treats the more recent alignment between venture capitalists and scientists, particularly those involved in information and biotechnology. In what might be termed a new paradigm, the scientist is no longer part of a gigantic corporation. He or she seeks to help launch a small to medium size business and, often, to run or have a major role in running the enterprise. This section reads in part like a manual on how to convince the venture capitalist to underwrite and market scientists’ innovative ideas. The key is to sell oneself as much as one’s ideas. “Bet on the jockey, not the horse,” is a famous proverb of the venture capitalist world. “Jockeys live longer than horses, and they’re the ones that have got to steer the horse, to correct the errors of its ways, and to make adaptations to course conditions and the behavior of rival horses” (p.291). And, especially, avoid the term “new paradigm.” As one venture capitalist put it, “[I]f I had a dime for every company that has told me it was the new paradigm, I would be rich enough to pay Bill Gates’s legal bill” (p. 290). If there is a link between these otherwise very different books, it probably lies in Shapin’s notion of the moral ordinariness of the scientist and the compatibility of this notion with modern democratic sensibilities. There is a rough parallel between the demise of the 19th century gentleman-amateur scientist and the expansion of the right to vote beyond its 18th and early 19th century restriction to white male property holders. As scientists became less like philosopher kings and more like insurance salesmen, so too the expanding franchise brought the property-less, blacks and women to the ballot box. Today, no one would question the factory worker having the same access to the ballot as the factory owner. There is a moral ordinariness to all of us in the voting booth. Ideally, rationality and an empirical weighing of choices, roughly analogous to the scientific method, should drive the functioning of our democracy. But it is difficult to see this degree of rationality at work in today’s cantankerous democratic processes, whether at the ballot boxes or in the halls of Congress. It is easy to agree with Ferris that science and democratic evolution have historically been mutually re-enforcing. But science’s influence on contemporary democratic practice seems more suspect. Further, there is universality to science — as Ferris says, no Eastern or Western science, “just science.” Democracy, however, is shaped by profoundly idiosyncratic factors, such as history, culture, and tradition. India, Sweden and the United States are all democracies, yet are far from carbon copies of one another. Ferris’ interpretation nonetheless provides us with plenty to think about, and I hope his book will prove to be a major contribution to our understanding of how democracy evolved. Shapin candidly states that his book is primarily for academic historians and social scientists, unlikely to be of interest to the general reader. But this general reader was pleased to have taken the plunge, finding his work surprisingly engrossing. Both works enhance a reverence not only for science but also for creative thinking.